More recently than ever, parents are struggling to provide basic necessities for their children. Whether in a single-parent or traditionally family structure, they do as much as they can in the present for their kids as they maintain hopes and dreams they enjoy prosperous futures, even in the most unrealistic times. And that's where Jozy Altidore knows he can make a difference for hundreds of men, women and children around the world with his foundation. A non-profit foundation that was founded in 2011 by the United States/international soccer star, Altidore's philanthropic endeavor has a simple goal. That mission? To help children in need any way it can. Whether through donations, corporate events, public appearances or fundraisers, the foundation is dedicated to raising money for the underprivileged and those in need of assistance. The foundation has its hand in many projects at the moment, highlighted by a successful partnership with Generosity Water, a not-for-profit organization that helps bring clean water to people in struggling, poverty stricken nations around the world. Jozy and his foundation raised money through public donations that went toward the building of a well in Haiti that provides clean water to more than 400 people in a village outside one of the poverty-stricken country's major cities. 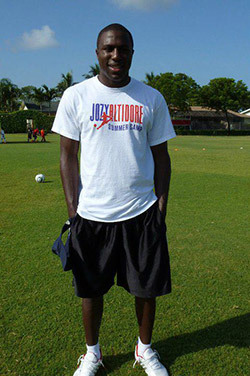 Most recently, Altidore�s foundation partnered with St. Luke Foundation to bring live television coverage of the 2016 Copa America Centenario to numerous cities across Haiti, The project, solely funded by Altidore�s foundation, enabled live broadcasts of all group-stage matches featuring the U.S. and Haiti, as well as the semifinal and championship games. Altidore's foundation has been involved with several other campaigns, including projects with fashion icons David Yurman and Kenneth Cole, Victoria's Secret supermodel Adriana Lima, NASCAR star Denny Hamlin, Love Your Melon and Autism Speaks. Altidore and his foundation are embarking on the most important fundraising campaign/project in their history later this year when they attempt to raise hundreds of thousands of dollars that go toward funding for pediatric-cancer research and assistance programs. Funding generated will go to doctors and scientists doing critical research on the various forms of childhood cancer that will hopefully save lives and potentially eliminate cancer all together. It will also go toward funding for the following things: patient-support groups; and, programs created to assist families with transportation/places to stay as their child takes on the toughest battle of their young life. "Putting an end to all forms of pediatric cancer is something we have to do," Altidore said in a recent interview. "Federal funding for childhood-cancer research is grossly underfunded, which is completely unacceptable. Hopefully, this fundraiser can help change that and move things forward in our goal of helping to eliminate all kinds of pediatric cancer in the world." Lindsey Altidore - the foundation's president - is in talks with several donors and fellow philanthropic groups worldwide as she plans on creating truly amazing events/fundraisers that will benefit people in the U.S. and around the world. Lindsey attended "Haiti Today," an event at SoHo House in Los Angeles that welcomed some of the the most high-profile players in the philanthropic world focusing on humanitarian/relief efforts in Haiti. It was a "Who's Who" in the non-profit sector put on by the Global Philanthropy Group and allowed Lindsey to establish numerous contacts that have led to discussions for some potentially bigger events later this year and into 2018 as well. The foundation has also been successful raising funds by hosting a summer soccer camp for children ages 5 to 18 years old at St. Andrew's High School in Boca Raton, Florida. The benefits of this camp are priceless: motivating them to learn the sport, teaching them about teamwork and sportsmanship; and, ingraining the solid personal fundamentals of leadership and commitment. The camp has been so successful that the foundation is planning on hosting similar camps in 2018 in New York, New Jersey, North Carolina and other parts of Florida.